Colorado's fifty-four 14,000 foot peaks and its even more numerous high 13,000 foot peaks have always been a magnet for the Mountaineers. They provide great weekend hiking, climbing, snowshoeing, skiing, or (nowadays) running destinations for those seeking exercise, adventure, and fabulous mountain views. Most of the southern and central peaks in Colorado are, fortunately, accessible to the Mountaineers via weekend trips. Trips to the Colorado Fourteeners began in the 1950's, at the same time that the Mountaineers' club was being formed. Outdoor enthusiasts from Los Alamos began to drive up to Colorado to club the high peaks, either as private groups or as small club trips. Charles Mader was a Los Alamos scientist who enjoyed climbing Fourteeners, starting with Blanca Peak in 1954 when he was a summer student at the Lab. Chuck climbed with many Club members, including names mentioned earlier in this history: Emily Wilbanks,George Bell, Gene Tate, Liz Gittings Marshall, Tom Stephenson, Ken Ewing, and Marvin Tinkle. Chuck recalls that "Most people who came to town were single. It was considered risque for a single woman to join a group of men for a climbing trip. A youth group was formed at the Methodist Church and by 1960, 50 couples were married, none ever divorced!" Chuck Mader's friend Ed Williamson wrote a novel called "Durango Light," which featured a character Buck based on Chuck Mader. The novel is set in Durango and describes life, love, and other adventures in Durango, including climbs of Jupiter, Windom, Sunlight, and Mt. Eolus. Figure 1 is the photograph of Chuck Mader used on the cover of the book, which was taken in 1959 on top of the Crestone Needle. The group had just finished the rescue of a couple of climbers who had spent the night on a ledge on the Ellingwood Arete after having lost their rope. The photograph of Chuck (above) was taken by one of the rescued climbers. Chuck Mader climbed Little Bear in August 1955 with Ken Ewing on a trip led by Tom Newton. 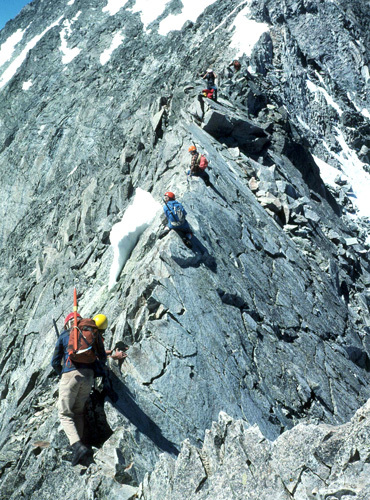 Later Ken Ewing, Dave Brown, and Don Liska led beginner rock climbing parties on the Little Bear - Blanca traverse. Ken also recalls climbing in Colorado with George Bell and Bob Thorne. These early trips led to the formulation of the Club's "Articles of War" (the trip rules), which were read annually at one of the meetings. These trip rules included, "the local leader is in charge of all the people on the trip," and "other members of the party can't leave the trip until everyone is done." 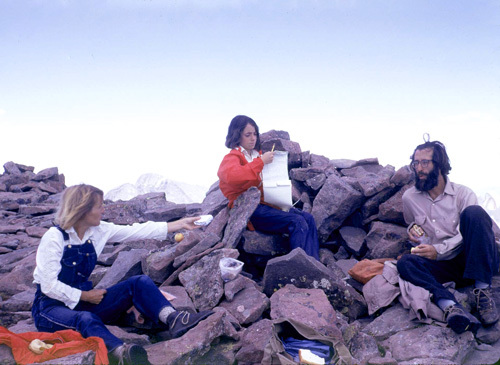 Lou Horak recalls that his first club trip, led by Ken Ewing, was Capitol Peak in July 1971. Indeed, Mountaineers trips to the Fourteeners have been one of the most popular introductions to club activities for many new members. Although some of the well-known Fourteeners have technical routes, most are easy walks or scrambles and provide a good introduction to mountaineering as well as a great way to get to know Colorado. Many of the more moderate peaks are suitable for family outings and provide an opportunity to introduce kids to the mountains. Don Liska recalls that some club climbers used to go into New York basin with Ernie Anderson and George Bell. "These were small scheduled LAMC outings. In the 1960's this was very wild terrain and most climbers only went to Chicago Basin. There was no trail and a lot of heavy side-hilling and bushwhacking to get in there. Inside the basin were Pigeon Peak and Turret. Pigeon is 13972', the finest peak in the Ruby Range, fortunately 28' short of being a 14'er which saves it from the crowds. Of course you could also climb Eolus from New York basin but few people bothered since Chicago Basin was so popular. During one of our climbs on Pigeon the rappel rope jammed and I had to do a hand-over-hand to retrieve it. It was a dangerous and foolish thing to do since had it come loose I would have been killed. Pigeon was a fine technical climb and to protect the approach to New York Basin we always swept our tracks clean with a branch when we returned to the much used Chicago Basin trail. This seemed to work for years as we always had the place to ourselves." Ginny Bell and George Bell, Jr. described a memorable club trip in 1970, when George Bell, Sr. led a group into Chicago Basin in the San Juans. "A 100 year storm hit, and it rained straight for 4 days. We were camped safely above the stream, but as the water got higher and higher we could see tree trunks coming down the streambed. We could hear loud cracks, as sections of the mountains' slopes let go, and sent mud avalanches roaring down the hillsides." One loud crack seemed to come from above their camp, so they ran out of their tent, with George Bell grabbing the kids. Fortunately the mud avalanche came down the next gully over from the one they were camped at . . . . So we never even got above timberline, but we had to use a rope to get the party back across the mudslide on the way out. When we hiked out to Needleton, the train tracks had all washed out. Fortunately the bridge was still in, so we were able to cross to the west side of the river. We had to walk out all the way to Silverton, occasionally contouring along the slope to get past places where the tracks just disappeared into the river for a few hundred feet. They had to rebuild the tracks." The next year, Ernie Anderson led a club trip back to the same area, but via the Lime Mesa road, because the railroad was not yet back in operation. Mario Schillaci learned how to backpack food on a trip that Don Liska led to the Wind Rivers in the 1970's, when some of the climbers did East Temple Peak. This was one of Mario's first trips with Don and Alice, and when they finally got to camp, he was very tired from the long exhausting approach. As the rest of the party sat down to heat their freeze-dried dinners, Don emptied his pack onto the ground. Out came a bunch of whole potatoes and onions! Don also had some cans of oyster stew, and so the Liskas had a fine stew for dinner -- no freeze-dried food for them. Later, on a 1980 club trip to Arrow and Vestal peaks, it was Mario who found a fresh supply of food -- some big mushrooms growing near camp. He told Don about them, so Don ran off and filled a big bag with them. Then they got out the stove, found some butter, and began to fry up a huge tasty snack. But Norbert stayed away, and wouldn't have any. With a serious look on his face, he said "You're all going to die!" Sure enough, a few hours later, while the group was lounging around the camp, there came a scream of pain from the meadow. Don fell to the ground, writhing around, yelling "Norbert, you were right! Those mushrooms were poisonous!" It was a great performance, and everyone laughed hard. Don Liska also started winter climbing (or at least climbs under winter conditions) on some of the most rugged of the Fourteeners. "As club trips we always did the Red Gully on Crestone Peak under winter conditions. Some trips were successful, and at other times the party had to turn back because of avalanche conditions in the gully. As non-club trips we did early season ascents of Kit Carson, Crestone Needle and Crestone Peak. The Crestone Peak trip was especially rugged, on snowshoes all the way." Mario Schillaci recalls that he was the first to propose the approach to Kit Carson from the west via Spanish Creek. This approach is a slog down low, but is the easiest way to the summit after leaving camp. Mario, Don Liska, Larry Dauelsberg, Larry Campbell, and Carl Keller climbed Kit Carson via the snow couloir, after fortifying themselves the night before in the tent by smoking cigars and drinking whiskey. In the late 1970's or early 1980's, Mario did a winter climb of the Crestone Needle in February with Don Liska and Tom King. While they were on the climb, Don's McKinley tent blew away, but Tom managed to find it. This was the first club winter ascent of the Needle. They contoured around to the notch, avoiding the direct steeper approach from below. This may have made the climb somewhat easier or safer if there was heavy snow, versus the approach from directly below. In the 1990's, Gregg Brickner continued this tradition with a series of annual winter attempts on Crestone Needle, but most years, bad weather or poor snow conditions prevented the party from reaching the summit. One memorable consolation prize was a midnight moonlight ascent of nearby Humboldt Peak. This long-running melodrama finally ended with the fifth installment: "V. Crestone Needle - The Climb." 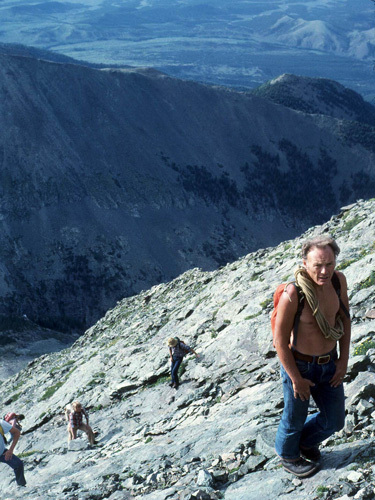 Other technical or semi-technical club trips to the Fourteeners included ascents of Capitol Peak via the Knife edge, ascents of Crestone Needle via the Ellingwood Arete, and early climbs on Longs Peak via Stettner's Ledges. A popular camping destination over the years was the Playground of the Bears above the town of Crestone, which provided good access for climbs of Kit Carson Peak via The Prow or Crestone Peak via the Red Gully. More recently, two of the club's top rock climbers, Sam Gardiner and Roger Rumsey have separately done climbs of Longs Peak via 5.10 routes on the Diamond. Regrettably, the most rugged of the Colorado Fourteeners -- the Maroon Bells, Blanca Peak, Capitol Peak, and the Crestones -- have also been the scene of a number of club accidents over the years, as described elsewhere in this history. (Bob Cowan photo, July 1978). Dave and Faye Brown came to Los Alamos in 1967 and may be the oldest club members still climbing Fourteeners. Some of their recent climbs have been 2-day trips, so that the approach times and elevation gains can be more spread out. The Browns also enjoy climbing the high Thirteeners, which are less crowded and often provide more interesting route-finding situations. They recall that the Mountaineers brought them some wonderful trips. When they got to where they couldn't backpack anymore, they really appreciated going on some of the llama or horse trips that Bill Priedhorsky led in canyon country. (Bob Cowan photo, June 1973). For many members of the Mountaineers, climbing Fourteeners or high Thirteeners is an ongoing activity that provides a great opportunity for visiting Colorado, getting in shape, enjoying the mountain scenery, and meeting other climbers. 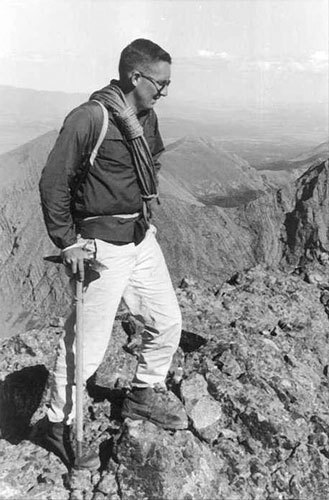 Many club members have climbed all 54 Fourteeners, beginning with Charles Mader, who was the 65th person to do them all. Others include Bob Cowan (the 234th, see article), Gene Tate (the 249th), David Brown (the 250th), Harry Hoyt (the 283rd), Len Margolin, Gary and Lynn Clark, Norbert Ensslin (almost, Bill Geist, and Jason Halladay. Faye Brown has done over 45 of the Fourteeners, including a "women's section" climb of Mt. Elbert with Elizabeth Kelley, Leslie Champ, and others in June 1981. Barry Smith and David Rogers are among those who have climbed the 100 highest peaks in Colorado.